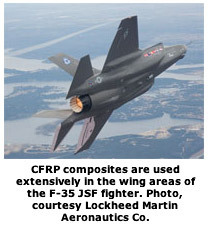 Because of their very desirable strength-to-weight characteristics, carbon fiber-reinforced polymer (CFRP) composites have long been a favorite of aerospace designers. The use of these composites has been more widespread in Europe than in the United States; however, industry insiders predict CFRP composites will undoubtedly be used in an ever increasing array of applications in this country, particularly in the transportation industries. Carbon fiber-reinforced polymer composites cover a wide range of layered and matrix materials using woven carbon fiber, resins, plastics, and can also include thin layers of metals. However, because of the different physical properties of the materials used in the layers that make these composites hard, tough and strong, they are extremely abrasive and difficult to machine. Without tools designed for the demanding cutting environment, tool life can be very short when machining CFRP composites. The combination of materials in CFRP — a resin matrix and carbon fibers — presents a formidable machining challenge. The matrix is susceptible to oxidation and degradation from excessive heat, and the carbon fibers don’t cut well because they fracture instead of shearing smoothly. Unlike the machining of metals that produces continuous deformation on the shear plane to form a chip, the machining of composites results in a series of brittle carbon-fiber fractures producing dust-like chips that carry away very little of the heat generated by machining. Another toolmaker challenge is that manufacturers of composites are very secretive about their composite formulations, and they tend to frequently alter these formulations. So, the performance of a tool that had been working well might suddenly degrade because of an unknown composite material adjustment. Then, it’s back to the drawing board to come up with a geometry that results in satisfactory performance. When machining composites, using coolants can be problematic. In many applications, the use of any foreign material — such as a coolant — is forbidden. “I have heard of several instances where the use of a coolant on a composite has resulted in drilledhole shrinkage over time,” said Peter Diamantis, plant manager at Amamco Tool. To enhance strength and performance, hybrid structures consisting of CFRP and metal layers, usually aluminum and/or titanium, are used. These CFRP/metal stacks are drilled so tighttolerance holes and patterns match on assembly. In addition to dealing with the abrasiveness and heat sensitivity of CFRP, the conflicting drilling requirements of the dissimilar materials in a composite/metal stack pose a challenging problem for tool designers. The challenge is to develop a tool that can deal with the combination of differing material characteristics present in a composite stack: the relative softness of aluminum, the hardness of titanium and the abrasiveness of the composite. The most difficult combination is CFRP and titanium alloys because the best strategy for drilling CFRP is high speed and a low feedrate, while the best strategy for titanium is low speed and a high feedrate. A successful solution involves a compromise entailing the tool’s ability to cut each material in the stack effectively. Effective chip evacuation is critical in drilling composites because of the confined nature of the operation. When drilling through a composite to a metal layer, the hard metal chips must be effectively removed to prevent them from scarring and damaging the walls of the composite hole. In some cases it is necessary to drill and ream the metal layer first so chips do not have to pass through the composite layer. To successfully machine CFRP, shops usually turn to the two hardest tool materials: sharp solid-carbide tools coated with hard, long-lasting diamond. A number of coatings are referred to as "diamond," including polycrystalline diamond (PCD) insert drills, vein PCD drills, or brazed mandrel drills. But, a diamond coating applied by the chemical-vapor-deposition (CVD) process is the only coating that utilizes 100 percent real diamond crystals. CVD diamond coatings reduce heat and friction created by the highly abrasive composite. Diamond is composed of pure carbon atoms, arranged in a special crystal orientation that gives it its unique physical properties. At 9,000 to 10,000 Vickers, crystalline diamond is nearly twice as hard as amorphous, diamond-like coatings. Amorphous diamond, or diamondlike coatings, are carbon films, applied using a physical-vapor-deposition (PVD) process, that usually are not as thick as CVD-diamond films. They do not have a crystalline structure and typically have about 10 percent to 15 percent the life of CVD diamondcoated tools. And, unlike metal-sintered polycrystalline diamond that applies a diamond tip to tooling, CVD crystalline diamond coating enables the entire tool surface to be protected with a super hard material. Being able to coat unique geometries provides a significant advantage over PCD tools, which is expensive to grind. A new drill has been designed for CFRP applications, featuring large relief angles for sharpness and chamfers and/or radii on the corners to avoid wear. Beyond these common features, the drills are designed for each application because different geometries are more or less useful depending on the type of CFRP, which is commonly layered with other materials. 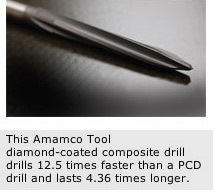 The drill is coated by a unique CVD diamond coating process that overcomes the tendency of a CVD coating to round a tool’s cutting edge that could offset any toollife gains by reducing sharpness. The duller the tool, the less likely it is to make a clean cut that avoids delaminating the material. The ability of a diamond coating to increase tool life and prevent composite delamination was demonstrated in a tooling development program conducted by the National Center for Defense Manufacturing & Machining (NCDMM) under the auspices of Lockheed Martin Aeronautics Co. (LMAC) manufacturer of composite components for the F-35 Joint Strike Fighter. The resulting tool for machining composites relies heavily on DiaTiger, a CVD diamond coating produced by Diamond Tool Coating. The drills excel in carbon fiber composite applications, significantly increasing the number holes drilled in aircraft wing-skins compared with PCD tooling. The new tool design and material increased tool life from 9 l inear f t at one- thi rd mater ial thickness to 57 linear ft at full material thickness. Now, LMAC can machine a complete wingskin using only two tools, one to rough and one to finish, instead of the 24 cutting tools used. Resulting cost savings per aircraft is about $80,000. The reinforcing carbon fiber is produced by thermal decomposition of polyacrylonitrile (PAN). The thermal decomposition converts the PAN fiber to a pure carbon fiber that is highly abrasive yet very strong. Carbon fibers are reported to have tensile strengths of about 800,000 psi and a modulus of 40 million psi. These high-strength fibers are woven into thin sheets and combined with resins to form prepregs. The composite skin section of an aircraft is normally produced by placing multiple layers of this prepreg in molds and then using pressure and heat to cure the CFRP into a complex wing surface. The carbon fibers also can be chopped and blended with resins to form structural parts and then processed by compression molding or resin-transfer molding.